Drawn and Quarterly, 9781770462991, 96pp. Since the 2011 release of Goliath, Tom Gauld has solidified himself as one of the world’s most revered and critically-acclaimed cartoonists working today. From his weekly strips in The Guardian and New Scientist, to his lauded graphic novels You’re All Just Jealous of My Jetpack and Mooncop, Gauld’s fascination with the intersection between history, literary criticism, and pop culture has become the crux of his work. Quiet moments in Goliath’s life as an isolated soldier are accentuated by Gauld’s trademark drawing style: minimalist scenery, geometric humans, and densely crosshatched detail. 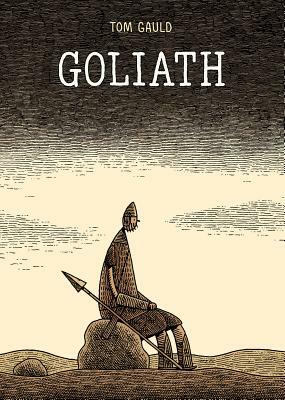 Simultaneously tragic and bleakly funny, Goliath displays a sensitive wit and a bold line—a traditional narrative reworked, remade, and revolutionized into a classic tale of Gauld’s very own. Tom Gauld is a cartoonist and illustrator. He has weekly comic strips in The Guardian and New Scientist and his comics have been published in The New York Times and The Believer. In addition to his graphic novels You’re All Just Jealous of My Jetpack and Mooncop, he has designed a number of book covers. Gauld lives and works in London.